David Buskin and Robin Batteau used to make their living as jingle writers in New York. If you are of a certain age you’ll remember “The Heartbeat of America” for Chevrolet, NBC’s “Just Watch Us Now,” and familiar ditties for McDonald’s, KFC, the US Army, and tons more. But that was then. After a shot of folk superstardom in the 70’s and 80’s, the two went separate ways only to reunite in 2008. But just before that, longtime Rose Gardeners who ever saw David Buskin with his three-man comedy/music troupe “Modern Man” saw a show they will likely never forget. I certainly won’t. We had maybe 70 people in the audience taking a chance on a group they’d never heard of. The first song was a rouser called “Jews Don’t Camp,” filled with good-natured innuendo and clever wordplay. Nobody knew how to react for the first 30 seconds or so, then a wave of laughter began to sweep through the room. The laughing continued for two hours and everyone went home exhausted but happy. The back of my head ached for the next few hours from laughing so hard. Buskin & Batteau, who will be appearing at Mansfield’s Rose Garden Coffeehouse at 8 p.m. on Saturday, Nov. 9, 2013, make their first return to the Rose Garden since 2011. Joining them again on Nov. 9 will be master percussionist Marshal Rosenberg. This is the Rose Garden’s 25th Anniversary season and one of the things we’re doing is a gallery display of black and white photographs of our performers over the years taken by Stephen Ide. It’s great to see how some have (or haven’t!) changed. The doors open at 7:30 pm. Advance sale tickets (highly recommended) are available, along full info on all the Rose Garden shows, at www.rosegardenfolk.com. 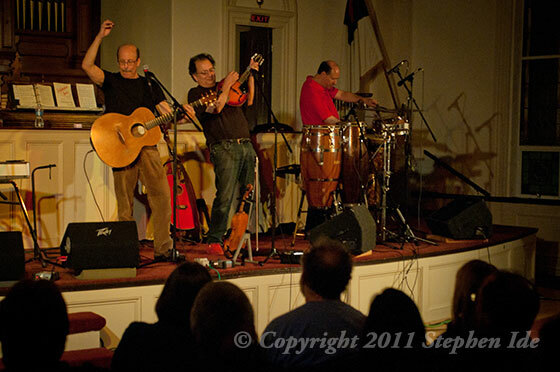 The Rose Garden Coffeehouse is held at The Congregational Church, 17 West Street, Mansfield, Mass.